Like that “pull-to-refresh” feature found in many popular iOS apps, including Twitter, Facebook, Tweetbot, Sparrow and others? Been wondering why Apple hasn’t implemented the same thing in its own apps, like Safari or Mail, for example, when such a thing would make for a dramatically improved user experience? As it turns out, the reason why the feature hasn’t made its way into Apple’s core iOS apps may have to do with a patent application titled “User Interface Mechanics” – an application which lists the inventor as Loren Brichter, creator of Tweetie. You know…Tweetie? The app Twitter acquired back in 2010, which later became the official iOS Twitter client? @dcurtis Twitter has a patent on it, though they’ve said they wouldn’t enforce it. #ProTip Every large software company has large piles of patents, most of dubious merit. Most use them as a purely defensive measure. Twitter is remarkably good at contributing opensource, some impressive stuff too. Patent attacks from them aren’t something I worry about. Nothing to see here, carry on? Sure OK. Except that Twitter doesn’t always do what’s best for third-party developers, Twitter does what’s best for Twitter. And while what’s best for Twitter right now (assuming it was granted the patent) is to not enforce it, that’s not to say that would always be the case. After all, if Twitter decided one day it needed to launch a patent attack on an uprising competitor, then it would do so if that’s what it had to do. And defending the patent would then mean other apps could get caught in the crossfire of the attack. So let’s hope it never comes to that. Also, just to be clear, it was Britcher who said he wouldn’t enforce it. One of the more opinionated posts on the situation comes from Jeremy Stanley, who notes that Apple reportedly uses uses pull-to-refresh in some of its own internal apps. (Yep it does. And we’ve confirmed, too.) Interesting that the feature hasn’t made it to the public-facing apps yet, then. 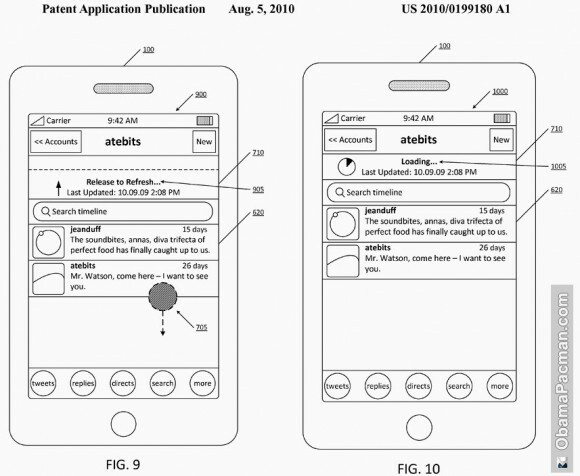 And if you’re wondering why there’s been so much interest in this one patent app, when every tech company under the sun has stockpiles of patents at their disposal, it comes down to the nature of the interaction being published. It’s a feature that feels so obvious, so natural, and so much like the way things are supposed to work on iOS devices, that many assumed it would eventually be translated into the core Apple apps. It feels like something Apple itself should have patented, then graciously suggested to iOS developers and designers that it’s the preferred way to refresh data in their apps. How odd if such a thing should fall in Twitter’s hands instead. Good thing Twitter and Apple are best friends.